Behind the Scenes of NASCAR Racing lifts the curtain on America's fastest-growing spectator sport. 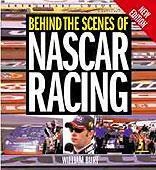 Author Bill Burt updates his 1997 best-seller and zeroes in on the processes that bring the show to the tracks and to the fans. Learn all about the ever-changing rules, aerodynamic advances, new tracks, and the sweeping current of high-tech engineering that have transported the sport from shade-tree wrench-turning to the computer age. Meet the behind-the-scenes people who make it all happen, learn how the cars are built, understand the complex operations in the garage, and experience the dramatic lead-up to race morning. Behind the Scenes takes the reader, in detail, from sponsor dollars to checkered flag, NASCAR-style. New edition.